Our brand is how we're seen by everyone - volunteers, people affected by MS and members of the public. It’s made up of the way we look, the way we communicate and the way we behave as an organisation. The way we look helps people build recognition of the MS Society brand. Everything - from leaflets and posters to newsletters and certificates - should be consistent and distinctive in order to show us as a forward thinking and personable organisation. As a volunteer you're a representative of the MS Society, so it's important to remember that everything you do affects our brand. It is important that the way we describe MS and the way we write about ourselves is consistent across all our materials and publications. Using our key messages about MS and the MS Society enables us to do this. We've created short, medium and longer versions to ensure there is a version to suit your group's needs. You must not change our key messages without permission. When we talk generally about our volunteer-led groups, we use the term ‘MS Society groups’ or ‘our groups’. When we refer to a specific group, we say ‘MS Society + group name’. For example, ‘MS Society Anytown’. We want you to use our agreed terminology when you talk about your own, and other MS Society groups. Web to Print is our new tool to support MS Society groups to design and produce quality newsletters, stationery and promotional items. The Web to Print system includes of a range of branded templates with space for group specific information, photos and content to be added. Web to Print includes a bank of images with consent already on file. You can use these images with confidence that they meet our data requirements. You should follow our Brand Guidelines every time you use an MS Society logo. If you’re sending our logos to an external designer or website, you’ll need to send them our brand guidelines too, so they know how our logos should be used. If your group uses social media to share news stories, event images and information about MS, you must use one of our official social media profile images. 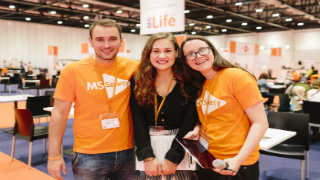 If you have a query about using our brand, contact the Brand Team at brand@mssociety.org.uk or call 020 8438 0700. For all other enquiries, contact the Supporter Care Team on 0300 500 8084 or email supportercare@mssociety.org.uk.